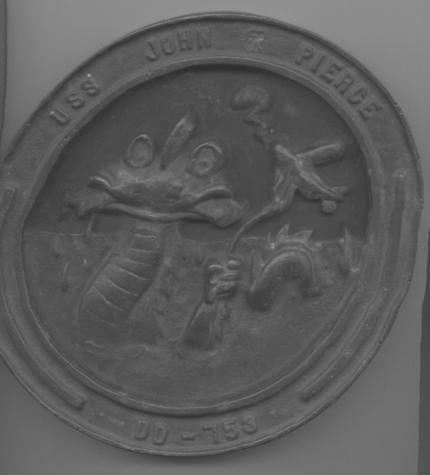 I found a ships plaque of the Uss John Pierce DD735. I was wondering if there might be a former crew member interested in it. It is solid brass and 7" in diameter and 3/4" thick. I would gladly trade it for anything nautical, Navy. An article in the New York Times on July 12, 1970 (don't know exact day), describes how the John R. Pierce was in volved in an incident with three other naval vessels off Fire Island Inlet. I was a Yeoman attached to Sick Bay during the summer of 1970. What started out as a battle for tuna turned into the Battle of the Atlantic yesterday for some weekend fishermen who found themselves in the target area of salvos fired by U.S. Navy warships on maneuvers. When the smoke cleared, it was apparent that the Navy had won a clear-cut victory. The fishermen's four cabin cruisers high-tailed it back to Fire Island Inlet thankful that the shells had missed their craft, although some had come perilously close. "For a minute, I felt like a torpedo boat captain dodging Japanese rounds," said Ronald J. Goldberg of 31 Sextant Road, Syosset, Long Island skipper of the "Barber Jack", a 31-foot Jersey skiff, recalling vivid scenes from late TV movies. Goldberg's cabin cruiser and three other craft were taking part in a tuna-fishing tournament sponsored by the South Shore Marlin Club. They were fishing near each other some 47 miles southeast of Fire Island Inlet shortly after 3 p.m. when shells suddenly began falling around them. The four skippers learned later that four U.S. Navy destroyers eight miles to the north had trained their guns on the area and were firing for target practice. "In the first salvo they fired, one of the shells came within six feet of my starboard (right) side," Goldberg said. "It lifted the boat in the air. I was on the flying bridge. The steering wheel ripped out and I found myself hurled back into the cockpit. Three or four more salvos came in quick succession and the water was all white foam from the shells that expleded on contact." Nicholas Derrico of 1357 Anchor Drive, North Bellmore, Long Island, who was aboard his 31-foot boat, the "Guaglio", said he immediately radioed the Coast Guard to report that he was under fire. The Coast Guard called back a few minutes later and told him that they had notified the Navy and for the fishing boats to return to Fire Island Coast Guard station and give a full report. Just as the Coast Guard was speaking to Derrico, the Navy fired several more salvoes. Joseph Kaich fo 199 Secatog Lane, West Islip, Long Island, who was aboard his 25-foot boat the "Kathy Queen II", said that when the first salvo landed, the water engulfed the "Barber Jack" "and I thought that ol' Goldber was a goner. I firured he bought the whole farm." Kaich added that he kicked his throttle full speed ahead and "the damn thing acted as if the boat wanted to get out of there itself." The fourth boat in the area was the Lynn Dee, but the skipper left immediately when the boats returned to Fire Island Inlet, apparently too shaken to discuss the harrowing incident. Goldberg, Derrico and Kaich estimated that the Navy destroyers fired four to five salvos of some 12 rounds each or between 45 and 60 rounds. They were prsumed to be five-inch shells, but the Navy refused to say what type of ammunition was used in the gunnery practice. A spokesman for the Third Naval District, 90 Church St., said that four destroyers with "weekend warriors" - naval reservists - were involved in the incident. They were identified as the USS Huntington, the USS J.R. Pierce, the USS Masey and the USS Moale. He said that a Notice to Mariners, No. 29 was given out to Coast Guard stations warning that gunnery practice would be held in the area yesterday afternoon. However, none of the skippers saw any notices distributed by the Coast Guard. The Navy said the incident would be investigated. I'll try to make a long story short... In the course of family history research, I came across your web site. My wife's family is Reeves. Lt. Cmdr. John Reeves Pierce's mother is directly related. In our family Bible we have the original printed program from the launching and dedication of DD 753. I would like to donate it (in digital form) for use on the web site, if you'd like. Please let us know. We'd often wondered whatever happened to DD 753, and are very happy to have found more information than we ever expected. Congratulations on a very thorough and interesting web site, and for keeping history alive! A year prior to our deployment to the primary Mercury recovery area north of Puerto Rico in May 1962, my primary billet was as First Lieutenant, responsible for all of the deck force - about 60 officers and men - and associated equipment. As such, I was directly involved in the strengthening of our forward boat davit by the addition of two thick vertical welded steel plates. This davit was one of two davits on the port side that held a motor whaleboat we called the captain's gig, and allowed it to be swung out over the side of the ship and be put in the water, and recovered. The davit needed to be stronger in order to recover a Mercury spacecraft - in the unlikely event that such was ever needed. My deck crew had trained in the manual recovery procedure - ropes and all - under the tutelage of my senior BMs. Shortly afterwards, I left the deck department and was assigned as Ship's Navigator, the position I held during the Carpenter flight. As all may recall, Scott Carpenter overshot the landing point - in fact the entire landing area - as a result of firing his retro rockets with the spacecraft pointing high of the proper angle, and indeed landed some 250 miles downrange of the carrier - creating a real cliff hanger. The Atlantic Ocean land-based system for long-range sonar triangulation - SOSUS - was used to very quickly locate Carpenter. In a few minutes the SOSUS position report came by radio from the cape over one of the bridge speakers. I plotted the position and realized that not only were we the closest recovery ship, we were still nearly six hours away, even at maximum speed. I immediately recommended to the skipper a course of 119 degrees. We came right with full rudder, and flank speed was ordered on the engine order telegraph, with all the turns we could muster! Many crewmembers will remember that ride. We kept our fingers crossed that the spacecraft wouldn't sink before we got there. Six hours and two hundred miles later we made a night rendezvous with the German freighter that was standing by, and successfully completed the only DD recovery of a manned spacecraft, and the only nighttime recovery by anyone. As the officer most familiar with these recovery procedures, I left the bridge and went to the portside recovery area to provide direction, advice and assistance as needed, standing under the glare of the lights. We also recovered the liferaft used by Carpenter prior to his being plucked from the ocean by choppers from Intrepid. About midnight, we steamed alongside the carrier, and highlined spacecraft contractor personnel aboard. They inspected the spacecraft, now sitting on the main deck, port side, (where our motor whaleboat usually resided), and drained most of the water out of it. The next day, after dropping the spacecraft and contractor personnel off at Roosevelt Roads, we headed back to Norfolk. The ham who was part of the pool coverage team ran phone patches back to Norfolk, and I was able to speak briefly with my wife, Paula. With the help of some 'liberty' turns, we arrived three days later at the our home port - the Destroyer/Submarine piers in Norfolk - to quite a welcome! "Also in 1960, she had a Mediterranean, Caribbean and a shake down cruise." I believe this should read '1961.' We went to the Med in early Oct 1961, and as noted, returned on April 1, 1962. During my 35+ months aboard - June `59 thru May '62, we made only one 7-month deployment to the 6th fleet. I have two longtime friends who were Pierce sailors, one before me who was aboard when Mt53 blew, and one who served part of the same time that I was aboard. I was just reminiscing a bit about my days aboard the USS Newport News, CA-148, and I remembered a temporary duty assignment that our band filled aboard the USS John R Pierce. We were musicians, Unit Band #198, assigned to COMSECONDFLT which was, at the time, aboard the USS Newport News. Coming from a Heavy Cruiser, we found conditions to be much more cramped than what we were used to. I remember on two occasions being awakened in the wee hours of the morning, to get out of my rack and wait patiently with another mate who had the misfortune of having a berth above the locker of the guy who was getting up to stand watch. We stood, I'd like to think, patiently, but I'm not sure that's entirely true, while the young sailor got dressed for his watch. Then we were permitted to sleep for four hours until he got off watch and we could get up again and wait for him to get out of his gear and turn in. I was really impressed with the commitment that everyone showed as they went about their daily routine. Our job was simply to stay out of their way, which was not an easy task. Nevertheless, we were treated well and made to feel apart of the crew for the short time that we were aboard. When the day finally arrived for the honors, it was quite a scene. The Blue Angels flew over and performed all sorts of maneuvers while we played the King's National Anthem and the saluting batteries roared their welcome. It's a memory that I'll always cherish. I began looking to see what had happened to the Pierce and was saddened to find out that she, like our own ship, had been stricken and taken apart. I had no claim to her, but I still felt sad that something that was the source of so many good memories had gone by the wayside. I hope she lives on, serving the country in all kinds of useful ways. Well, thanks for the chance to relive a great part of my life with you. I wish you and all the crew of the USS John R Pierce the very best.